Release date: 23rd May 2017! All details on the new Netent slot! 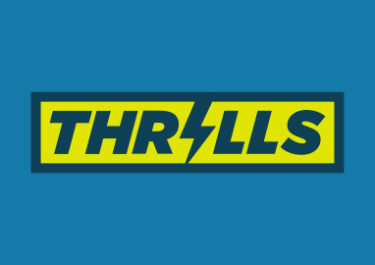 Until now the team at the Swedish studio has been pretty secretive about this new slot game but today we were able to get hold of all the details about it. 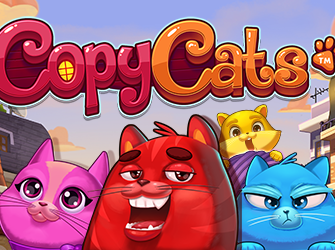 So sharpen your claws, polish your whiskers and get ready to chase these colorful cats across town for tons of copycatting excitement. Named Copy Cats™ and ready for release on 23rd May 2017 it will feature four lovely kittens, a new pay mechanism and a bonus round. 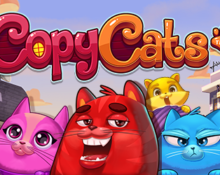 They are red, pink, blue and golden, these colorful kittens are not your ordinary house cats and will have you smitten in no time as they can copy themselves for a chance of bigger wins. 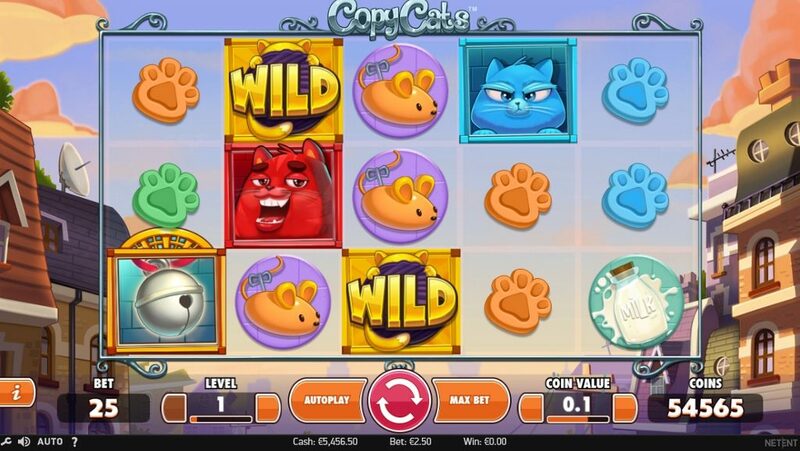 Copy Cats™ is a 5-reel, 3-row, 25-line (fixed) video slot featuring Free Spins, Bonus symbols, Wild substitutions, Stacked symbols, Stacked Wilds and a Copy Cats feature. 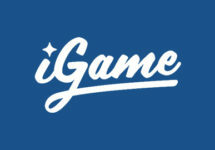 Bet levels and coin values range from 1 – 10 and 0.01 – 0.50 allowing for bet sizes between $0.25 – $125. Maximum pay on a single spin is 2,000 coins or 500x bet with a full screen of stacked Wild or Red Cat symbols. 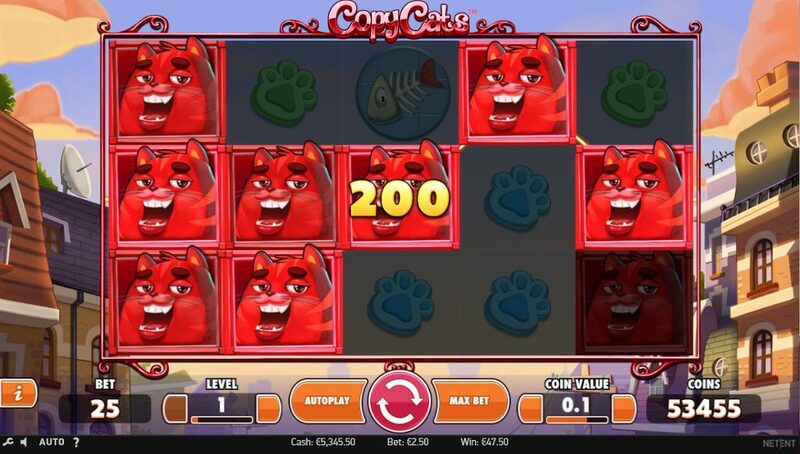 One new pay mechanism that Netent has introduced on this slot is the Copy Cat feature which activates when a full stack of Cat or Wild Symbols land on Reel 1 and will see all other cat symbols on the screen transforming into the same cat as on Reel 1. Pay symbols including Wilds can appear stacked covering all positions on a reel. Low pays are cat paws in blue, green, violet and brown colors, medium symbols are typical cat goodies such as mouse, milk bottle and a fishbone and high paying symbols are the four cats in red, pink, blue and golden. The latter being at the same time the Wild symbol substituting for all symbols except bonus scatters. A hanging cat play house is the bonus symbol and can appear on reels 1, 3 and 5 only. A full stack of any cat symbol or Wilds on Reel 1 will activate the Copy Cat Feature in the base game. All cat symbols on the other reels will transform into the cat from Reel 1 or Wild giving the potential for multiple line wins. All cat symbols return to their original state before the next spin starts. Three Bonus symbols landing on reels 1, 3 and 5 will activate 10 Free Spins, which can be re-triggered during the bonus round. 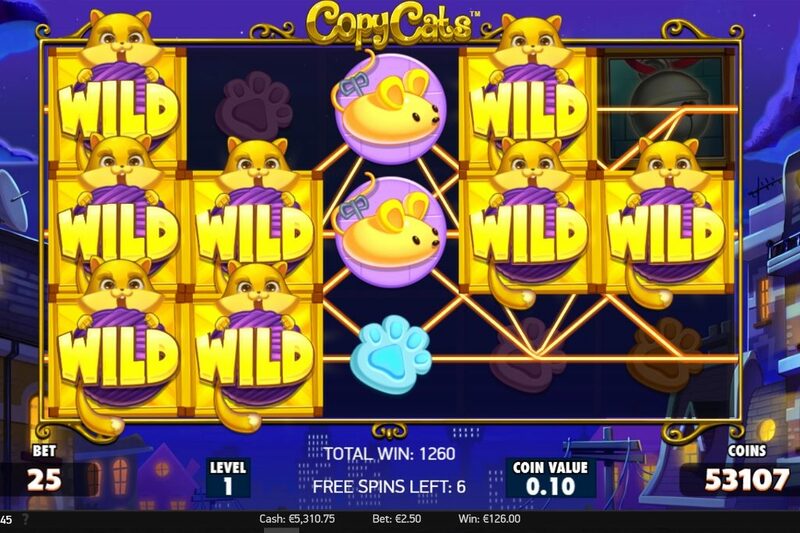 During the Free Spins there are no cat symbols on reel 1 except for the Golden Cat / Wild symbol, increasing the chances for mega wins when it lands as full stack on reel 1 transforming all other cat symbols on reels 2 – 5 into Wild symbols. To be honest, I don’t understand all the secrecy about this latest creation. It is at best a medium variance game with low line pays, no multipliers, no random features and only one type of Free Spins with no additional features, making it overall just an average new slot that will be suitable for grinding through a bonus wagering requirement. High wins above 1,000x bet should not be expected as the top pay for a single spin is just 500x bet which will need though to have either a full screen of Red Cat or Wild symbol. 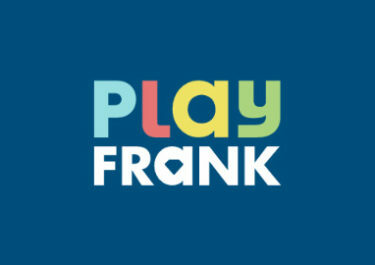 I expect it though to be quite popular with the cute kittens, enjoyable soundtrack and the relatively high hit rate for the bonus round which will probably pay on average around 20 – 30x bet. My first few spins on the game were certainly not boring but I wish Netent would release more of the likes of Jungle Spirit: Call of the Wild that has huge win potential compared to Copy Cats. Meeooww, have fun with the kittens starting 23rd May 2017!